So, exactly what should your puppy know at 4 months of age? As a guide dog puppy raiser we bring home our puppies at around 7-8 weeks old. I’ve been raising these guide/service pups since 2006 and over that time I’ve noticed something magical seems to happen when a puppy is around 4 months old. It’s around that time that everything clicks for a puppy. Potty accidents around the house rarely happen if at all, crate training is a breeze, the mouthy behavior starts to subside. QUICK RECOMMENDATION: We crate train all of our puppies and recommend the MidWest Life Stages Double Door Crate w/ Divider. We still have and use our first MidWest Crate we bought for Linus over 13 years ago! As I mentioned earlier we start training our puppies around 7-8 weeks old which means a 4 month old puppy has nearly 10 weeks of training under his belt. 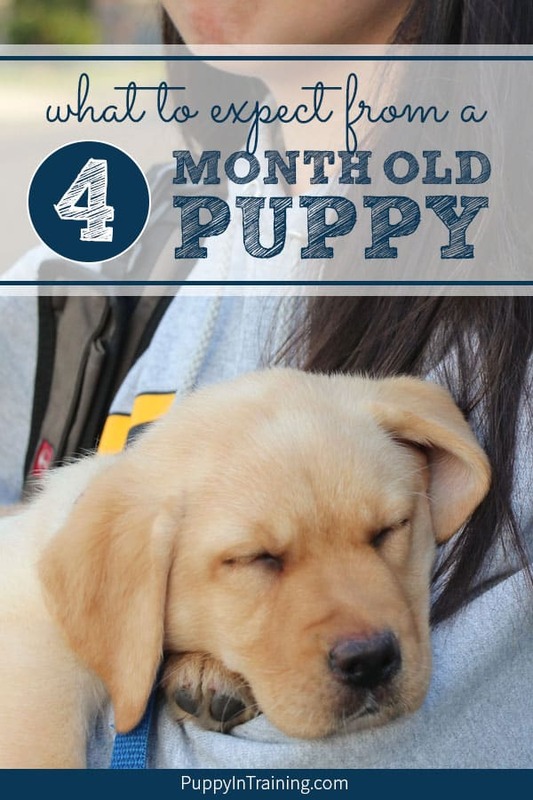 Of course if you got your puppy when he was 4 months old then your expectations should be slightly quite different then what you see on today’s list. Vaccinations – Your puppy gets his rabies vaccination which also signals the time when your puppy’s immune system is well developed. This is always a time of relief for me as I’m not as worried about the places I take my puppy. Feeding Schedule – We reduce our puppy’s feeding schedule by going from 1 cup of food 3 times a day to 1.5 cups of food 2 times a day. I don’t have to worry anymore about that mid-day snack. My other dogs are also happy because they don’t have to get excited about a non-existent meal (for them). Teeth – they start to fall out and as the teeth disappear so does the puppy’s bitey, nippy, mouthy behavior (thank goodness). QUICK RECOMMENDATION: We feed all of our puppies Wellness Core Puppy Formula. Okay Colby, vaccinations and feeding schedules aside what should my puppy know when he hits his 4 month birthday? House Training – It’s around this time that our puppy has fully grasped potty training. If not, they are usually very close with not much more than 1 accident per week. 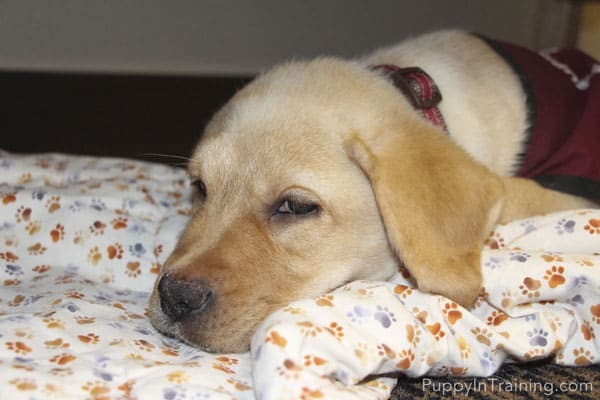 Crate Training – Can sleep through the night without incident. Can also stay in the crate for short periods during the day without barking, crying, howling, etc. Usually not 100% at this age, but puppy is allowed more freedom around the house. Can sit/down and wait for food for 30+ seconds until released. Places – pups are usually well-behaved on these types of outings. Dogs – pups are usually “just okay” at dog meet/greets. Sit – Usually close to 100% without distractions. Down – Usually close to 100% without distractions. Stay – Can sit/stay or down/stay without distractions for 30+ seconds. Come – About 80% reliable with recalls without distractions. Heel (Loose Leash Walking) – good with loose leash walks in known places like your neighborhood. QUICK RECOMMENDATION: Puppies for Dummies is a great book that will teach your the foundations of raising and training a puppy. We highly recommend it for the new puppy owner. By the way, did I mention Puppies for Dummies was the first book I read before bringing home my rescue puppy, Linus? 4 month old puppy in training. Ehh…she’s probably a little younger in this pic. I usually notice puppy bliss during the 4-6 month period as my puppy is still relatively small (compared to his full size) and cute, he behaves well, listens, and understands most of the basics. However, for some reason around 6 months puppies seem to hit a regression (at least mine do). My pup stops listening, he no longer understand his cues, he’s much bigger and not as easy to handle. I feel like we always take a step back with our puppy’s training around the 6 month mark. I think it’s kind of like the defiant teenage years we see in our human children. Anytime we hit a regression in training we take a step back and start working from the beginning. For instance, if our puppy starts having potty accidents in the house after we’ve given him a little freedom then we’ll put him back on his leash when in the house and keep an eye on him 100% of the time. This allows us to catch him before he has an accident in the house. How Was Archer As A 4 Month Old Puppy? QUICK UPDATE: It’s been several years since we first wrote this article. Archer is now a working service dog helping a little girl with a traumatic brain injury. Thank you to Cascade Service Dogs for finishing Archer’s training and placing him with his new partner. While he may be better at somethings he has regressed in others. At 8 months Archer’s biggest bane would have to be puppy zoomies. This is one of those things we probably should have nipped in the bud when he was a youngster. During a zoomies attack Archer has been jumping on the bed willing to play the chase game with any takers (Linus). This is a behavior we never saw in the 4 month old version of Archer. However, he did have puppy zoomies at 4 months and we should have managed those zoomies in a better manner to keep him in control during that frenetic behavior. QUICK TIP: One of our favorite ways to manage puppy zoomies is to put our pup on a short 4 foot tie down and give him his favorite chew toy. Bully Sticks work great because they can occupy your puppy for 10+ minutes giving him a chance to calm his energy. What were your puppies like at 4 months? 6 months? 8 months? Did you experience a similar bliss and regression with your puppies? What should your puppy know at 4 months of age? What should you expect? I recently adopted a 4 month old husky puppy. I’m pretty sure she was kept in a small kennel most of her life and allowed to pee/poop whenever she needed too. We are having a hard time with the potty training. She has never pooped in the house (though we have had some poop accidents in the crate), but pees constantly on the carpet (and only the carpet). She also does pee outside but won’t eliminate all of her urine at once. She will pee several times in small bursts and has recently started walk-peeing. We tell her a firm “no” and clap when she starts peeing in the house and immediately bring her outside. When she successfully pees outside we reward her with one of her favorite treats. Is there any other tips we should be doing? Since she is 4 months old already without much training (and being a stubborn husky) I know it’ll take a little bit more training to get her where she needs to be. What you need to do is take her out every 30 minutes after she has had her food and drink but feed her in her in crate not outside but make sure you take her outside on a leash when she has done her wees and pops give her a reward and plenty of praise as soon as she has finished also clean the areas where she has weed and pooped with an enzyme cleaner to make sure the is no trace of the dogs wee or poo same in the crate as this will tell the dog it’s a toilet but if there is a mat she has soiled take this outside and walk her up and down a few time then take her to the mat and say wee wee a few times stand by the mat and wait and if nothing happens take her in and wait half an hour to an hour and try again you have got to be consistent and patient. How do you nip the puppy zoomies?My 4 month old is doing that now. I have a just about four month old whom I recently adopted, and am having trouble with the potty training, too. Has yours gotten better?! I need hope! It never occurred to me to stop a puppy from having the zoomies. How would you do this? This was a great post! When I adopted my puggle the adoption place said he was potty trained. I got him back to my apartment at the time and that wasn’t the case. Needless to say my pup ruined those floors. After reading this post and many others I see the flaws in my potty training ways. There is so much to remember but they are our fur babies so they are worth it. I took a couple classes and downloaded a couple ebooks (one is here) and within a month he was much better. I always appreciate bloggers who share much-needed content with the rest of us who need the advice. Thank you. Help with training my guide dog he 10 week old puppy and I want him to become a service dog. How do I go about that? Out 4 month has decided she doesn’t have to COME when called. Come when called can be a difficult command to teach. If you tell your dog to “come” or use her name for her recall and she doesn’t come to you then she is learning that she does not have to come to you when you say her name or say “come”. I understand this very well as I had this issue with one of our puppies years ago. What we ended up doing is using a different command for recall and made sure to teach it properly. Basically anytime you use the recall command (we changed to “Here” for recalls) you have to make sure you dog always comes to you. We did this by using a long line anytime we worked on recalls. I’ll put together a more detailed blog post on teaching recalls in the next few weeks. Hopefully this helps for now. Good luck with your training.